Bear Grylls Survival Series Scout, Drop Point, Serrated. 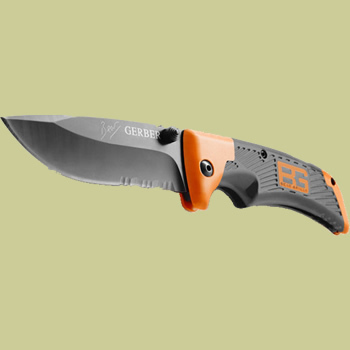 Weighing a mere 2.4 ounces, the Gerber Bear Grylls Scout folding knife model 31-000754 is lightweight and functional. Designed with Scouts in mind, but ideal for anyone who enjoys being outdoors, the Bear Grills Scout has a 3.3 inch stainless steel blade that is half serrated, half fine edged. The blade is easily opened with one hand by using the dual sided thumb stud. The blade locks while in the open position for safety. The textured, rubber gripped handle features a pocket clip and a lanyard hole for your choice of carrying. A Priority of Survival pocket guide is included.